One of the most important facets of working with threaded fasteners is knowing the torque requirements. Once you know the torque that you need to apply to a threaded fastener, there are several items that you need to examine. The first thing you need to determine is the tool type (inline, right angle, or pistol grip). Not only is this an ergonomic issue, but also will affect the repeatability of the tool by making sure the tool is aligned to the work in a consistent manner. Next, determine how the tool will control the torque. There are two main choices: mechanical clutch or electronic-controlled tools. A clutch tool can provide quite accurate torque at a lower price point. Electronic-controlled tools have a higher price point, but often include additional features. There are a few things to consider when choosing between a clutch tool and an electronic-controlled tool. To begin, there’s joint rate. Is it a hard joint (steel to steel) or a soft joint (gasket), or somewhere in between? Generally, joint rate is somewhere in between, but you can determine the overall joint characteristics without employing the strict ISO 5393 definition. If you are dealing with a very hard joint and using a fast clutch tool, you risk overshooting the torque. This doesn’t necessarily rule out the clutch tool. Perhaps you could choose a slower tool. The benefit to the electronic-controlled tool in this case is that you can slow the tool down at the end of the rundown to try to eliminate the overshoot situation. In addition, if the fastener has a prevailing torque that is higher than the target torque, an electronic-controlled tool can be programmed to overcome the prevailing torque and then begin looking for the target. Another thing to note is error proofing. The electronic-controlled tools have an advantage here as well, but there are some error-proofing tactics you can employ with clutch tools. For example, a pneumatic clutch tool can be used with a qualifier that will confirm that the has tool shut off within a certain air pressure and time parameter. Clutch tools can also be used with batch counters or to send a clutch signal to indicate that the tool shut off. The electronic-controlled tools can go a step farther when it comes to error proofing. Often, bar code scanners or socket/bit trays are used to ensure the right torque is applied to the correct job. These tools also generally have an additional error-proofing feature-angle encoders. This allows the tool to catch cross threads, strip outs, and other issues. The next characteristic to establish is the need for traceability and/or real data collection. Although some clutch tools can send out a clutch signal to perform line control, the data-collection part of the equation is limited to go/no go, good/bad, etc. The advantage of the electronic-controlled tool is that the transducer in the tool is traceable to NIST and the data you collect is sent in real torque values. Accessories are yet another aspect of maintaining accurate and repeatable torque. For example, it is a good idea to keep bits as short as possible, and to replace bits and sockets as they wear. You might not consider a torque arm a necessity on a low-torque application; however, it is one of the most important parts of a low-torque system. The torque arm limits the effect the operator has on the rundown. One final word to consider: consistency. What we have discussed will get you about 10-15% closer to your goal of accurate and repeatable torque. Keep in mind that around 90% of the energy that goes into running a fastener is used to overcome friction. Within your control, use fasteners of high quality, ensure the parts being assembled are drilled and tapped to high standards, and maintain consistency in the level of lubrication or lack of lubrication on the work and fasteners. Much thanks to our friends at ASG-Jergens! We look forward to presenting more of your expertise in future Guest Blogs. EDITOR’S NOTE: QSource.com is currently running ASG’s Free Power Supply Promo. Click here to learn more. Offer valid thru December 31, 2018. 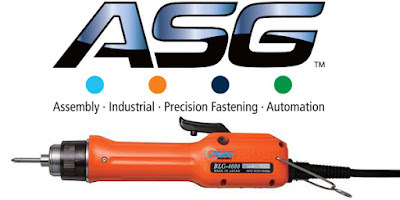 For more information about ASG-Jergens and their wide selection of torque tools and other assembly products, please visit QSource.com. You may also contact us via email or phone at 800-966-6020 and we will be happy to assist you.